According to report, ASUS (Taiwanese Multinational Company) is going to release Smartphone in its ZenFone 6 lineup including ZenFone 6 Lite, ZenFone 6 and ZenFone 6Z Smartphone. It is rumored that ASUS_I01WD may debut as ZenFone 6Z which has appeared on AnTuTu benchmarking platform with 363K+ scores and keys specifications. The phone will come with Snapdragon 855 processor, 6GB RAM & 128GB Storage and runs on Android 9 Pie OS. Let’s take have a look at AnTuTu listing. As per AnTuTu listing, ASUS ZenFone 6Z Smartphone comes with Qualcomm Snapdragon 855 SoC (System-On-Chip) and has 6GB of RAM. When we talk about its display support, ZenFone 6Z has FHD+ resolution of 2340 X 1080 Pixels. On other hand, ZenFone 6Z phones have received 363,172 average benchmarking score on AnTuTu, while the phone with model number ASUS_I01WD will come in two storage variant including 64GB and 128GB. If you are looking for best phone with 48MP camera support, then ASUS ZenFone 6Z Smartphone can be best choice. 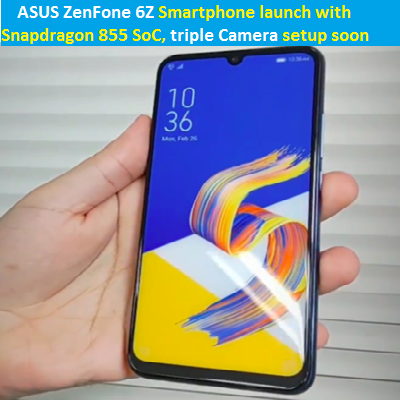 Further report, ASUS ZenFone 6Z Smartphone will come with 48MP camera sensor on its back. It is rumored that the phone will be equipped with triple camera setup and it may features a front-facing fingerprint sensor. ASUS is going to launch ZenFone 6 series of phone including ZenFone 6 Lite, ZenFone 6 and ZenFone 6Z on May 16 this year. At the moment, we all have to wait for ASUS’s Smartphone launch. Anyway, we are searching on the matter very deeply and we will defiantly post an update, if it will come in future. For any suggestions of queries, please write on comment box given below.